On average, the internet-browsing population views 3.5 billion search engine results pages, or SERPs, daily. There are several key features that are important to understand on the search engine results page. These features are what set your business apart from your competitors, and will help you improve your internet presence, as well as your business. The purpose of a search engine results page is to answer the user’s question. Whether you’re looking for physics formulas, the birth date of an artist, or researching Canadian vacation spots, the SERP should help. At SEO Long Island, we consider the SERP to be the first decision-making destination for most consumers. Interestingly, the SERP for each keyword is unique. Even rearranging similar combination of words could generate different results. For example, “SEO services Long Island”, “Long Island SEO”, and “SEO company on Long Island” could yield different results. As internet marketers, we have the unique responsibility of looking for opportunities within SERPs. With an outstanding attention to detail, the SEO team at SEO Long Island can aid you in ranking highly on SERPs for relevant keywords. How Does Google Determine Your SERPs Results? Based on your website’s business model, ranking intentions, and overall structure, your SERP goals may vary. For companies looking to draw real-life traffic, securing a spot in the local pack might be key. For stores seeking to sell products online, then incorporating results with embedded reviews could be the best strategy. So, Google determines the structure of the SERP, as well as which features to include, based primarily on the nature of the query. At SEO Long Island, we develop your website’s overarching SEO strategy based on the best possible rankings. Depending on the specific query, there may be one (or several) specialized SERP features present. 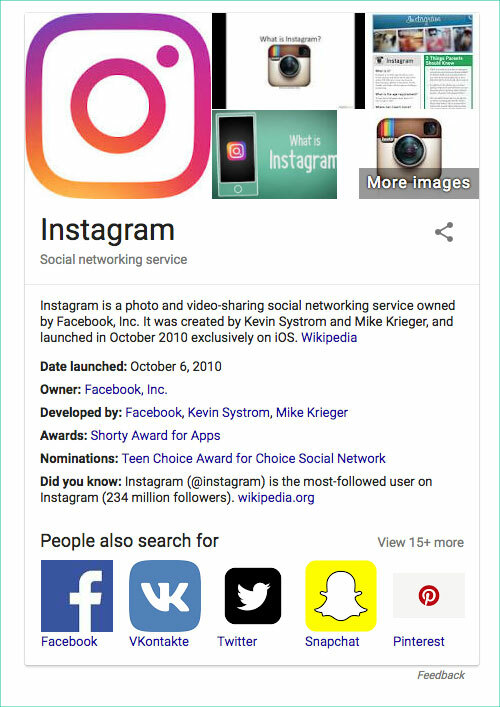 Google includes these SERP features to help users find the results that they are looking for with ease. SEO Long Island can help your company to earn the most relevant SERP features, and reap the maximum benefits. These are some of the most common (and helpful) features that searchers encounter. Organic rankings are the most important aspect of any SERP. Many searchers are conditioned to ignore all results, except the organic rankings. 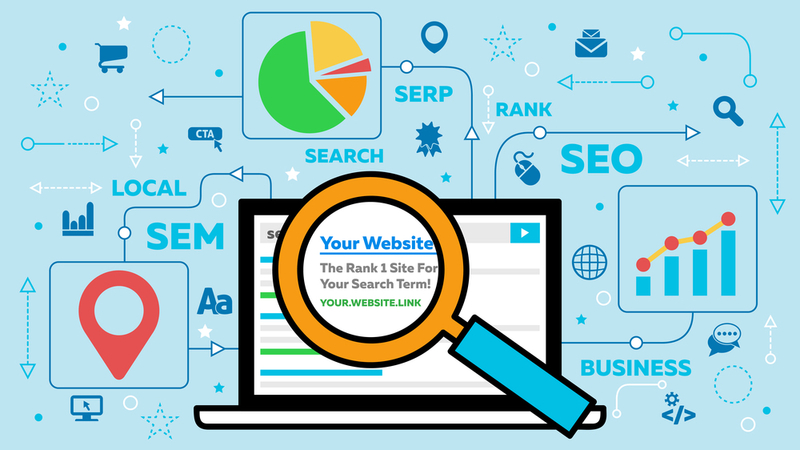 Websites can earn the tops spot of the organic rankings through optimizing their website for all SEO ranking factors. This includes earning strategic links, maximizing site speed, and most importantly, writing quality SEO content. At SEO Long Island, we have helped many of our clients to excel in organic rankings through diligent efforts. 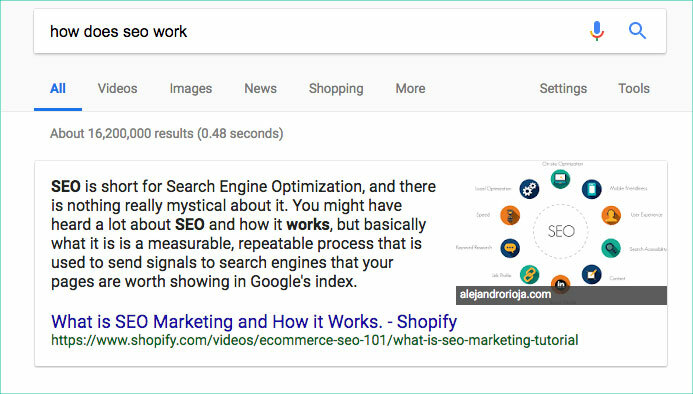 Featured snippets are one of the most desirable SERP features. Writing answers to simple, common questions is key to earning a featured snippet. As a Long Island SEO agency, we optimize web content for featured snippets by writing simple, formatted content. This is also referred to as ranking at “0”. While most people are looking to rank at the #1 spot for their desired keywords, ranking at 0 has become the coveted spot. 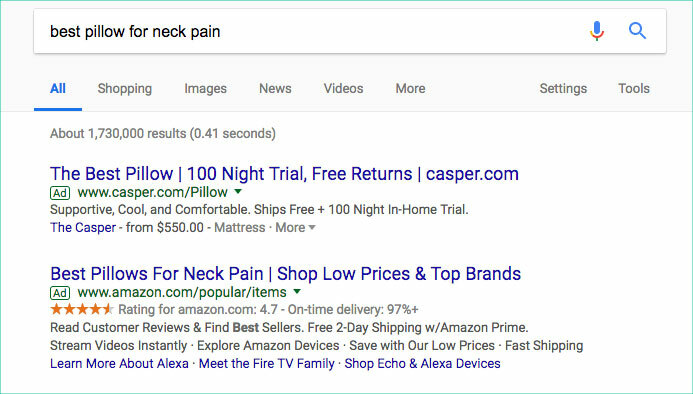 Paid results, often found at the top and bottom of the SERP, are denoted by a small box with the word “ad”. The value in paid rankings is that they are a quick and easy way for your website to gain exposure, with minimal efforts. The drawback to paid rankings is that they may signal to consumers that your website could not achieve organic rankings. The rankings also do not last beyond your payments. For keywords that generate demand from competitors, Google determines these placements through a complex bidding process. Google’s complex algorithm can detect when searchers are seeking a physical location, rather than a website. If your website relies on real-life traffic, then this SERP feature will be of great value. Google incorporates location-based results – including company names, addresses, hours of operations and potentially reviews. 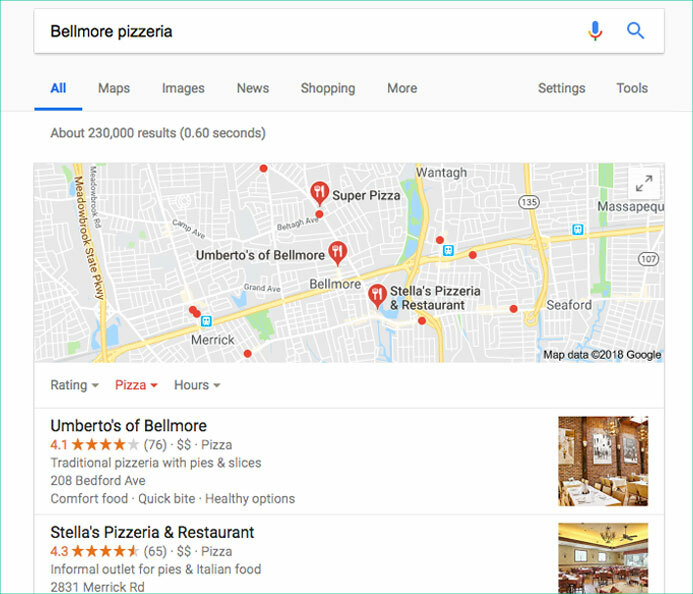 For example, searches that contain location-based elements (Bellmore pizzeria) or proximity specifications (pizzeria near me) may lead to local results. This is helpful for users to find what they need, and for businesses to bring in local traffic. When your website is optimized for local search results, you will be more likely to shop up on the search results map for relevant searches. Additionally, having an SEO company claim your Google map listing and optimize it will also help get you into the local results section of the SERPs. This feature is especially prominent for large, easily recognizable brands with many important website pages. Based on SEO value, relevance and other factors, Google’s website determines which sub-pages to include. 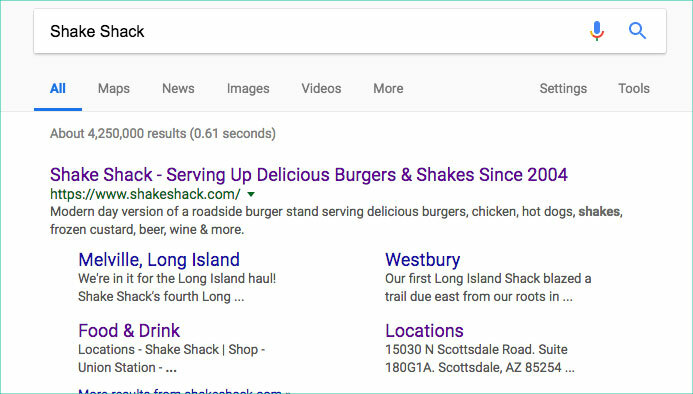 For example, searching for the term “Shake Shack” gives the searcher easy access to several pages, including the menu, locations, careers, and beverages. This is useful to users and businesses alike. Users can easily and quickly access what they need, while businesses have more opportunity for click-through from the SERPs. Immensely helpful for ecommerce stores, reviews can give customers a positive perception of your product, before going to your website. Through optimizing particular product pages, you can show all customers the value of your products. Information-seeking queries often lead to knowledge graphs. 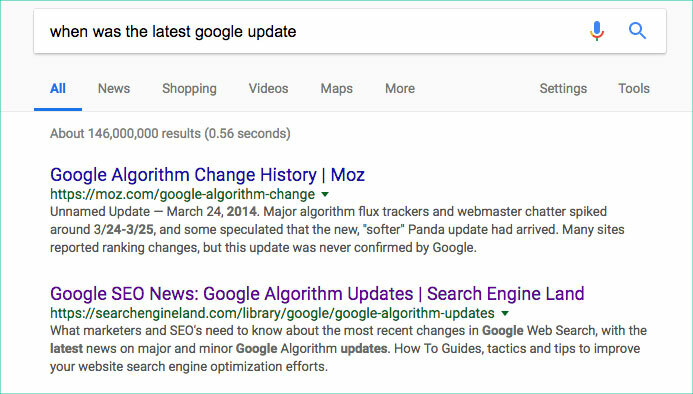 These SERP features often draw from purely informational websites like Wikipedia, to give users heavily formatted information. These results may also include pictures. When it comes to SEO, our main priority is to position your website as highly as possible on each relevant SERP. At SEO Long Island, our experienced team can help your website to earn valuable exposure. Through monitoring site structure, writing quality content and other SEO endeavors, you will generate more website traffic, and earn a high ROI.